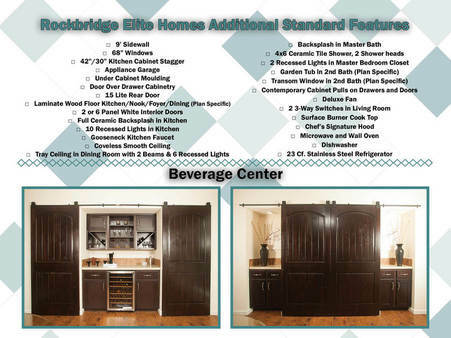 The Rockbridge Elite 2 – is one of our 6 Elite Floorplans in our Rockbridge Series! The Rockbridge Elite 2 is a 1980 square foot ranch that features 3 bedrooms, 2 bathrooms, and an open concept floor plan! 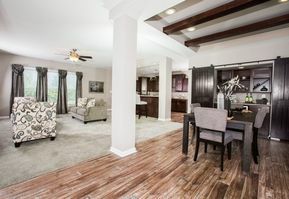 A large entry foyer leads you into the formal dining space or into the spacious Great Room! The Dining room features a beverage center wall! The Kitchen is a very large open space with great storage and countertop space; the standard features in the Elite are prominent here! The Master bedroom is off the Great Room it includes a large attached master bathroom with the walk in closet located here as well! The secondary bedrooms are off the kitchen hallway as well as the utility space, and secondary bathroom! Check out the standard features the Elite Series offers below! This entry was posted in Featured Home on May 4, 2016 by hshearer@commodorehomes.com.